Hey next time u go I reAly want in. My phone number is 1479 597 9144. My recent trip got canceled. Everybody had plans. I haven't had a chance to take my new xj out. And would reAly like one lol but fun only happens in numbers. Lol whats hf. well we had a drive shaft break and i put mine on its side a couple times. snoopy falls is getting alot more fun then it used to be. i took a bad line and ignored my spotter. we are trying to get everything fixed up so we can get back out there. Hey guys, I just got out here from Colorado a few weeks ago. I was up at king of the canyons race at canyons offroad park last weekend and was pretty impressed with the trails you guys have out here- I had a blast on that trail. I am planning on wheeling with a group at hf on the 29th also. 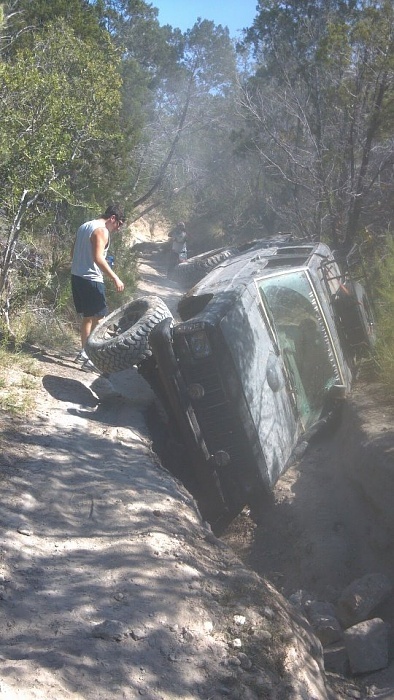 We plan on meeting at the HEB around 7am, so should be on the trails by 9am I am guessing. Definitely would be good to meet up with you guys out there. Last edited by gvns8; 10-24-2011 at 04:05 AM. Gah I wish I saw this before today! I will be there tomorrow hope to see some of you. I am going with a group of about 6 wranglers- on the trails around 9ish, but I will try to look for you guys before we head out. Us xj's gots ta stick together. Hey guys I was there. Post up next time you are going and we can actually meet up and wheel some runs together. I am getting my new 35s on this week and can't wait to test those out. Next time give a couple weeks heads up, then I can get that weekend off to come! Sounds like you guys had alot of fun, let me know next time you go!